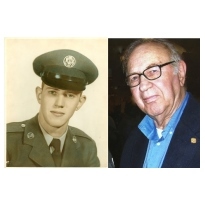 Joseph "Joe" Alexander Markley Jr.
Joseph “Joe” Alexander Markley Jr., 86 of Zanesville died at 10:20 P.M. Tuesday, August 7, 2018 at the Genesis Morrison House Hospice. He was born May 25, 1932 in Morgantown, WV the son of the Dr. Joseph Alexander Markley, Sr. and Bertha Virginia Foster Markley. Joe was a member of First Christian Church in Morgantown, WV. He proudly served his country as a United States Air Force Veteran of the Korean War and was a Green Beret with the Special Forces. Joe was a member of American Legion Post 29, Zanesville. He went to West Virginia University and Northwest Institute of Medical Technology and retired in 1990 from Good Samaritan Medical Lab as a Lab Technician. He was also a Boy Scout Master for over 20 years in West Virginia & Ohio and also was a Boy Scout Executive. His last time as a Scout Master was with Troop 132 in South Zanesville. He is survived by his wife, Doris H. Guseman Markley; his children, Thomas (Linda) O. Markley, Joseph G. Markley, Patricia J. Markley, and David A. Markley; 6 grandchildren, Stephanie (Maria) Slone, Brent (Missy) Markley, Ryan Markley, Adam Markley, Amanda (Robert) Buch & Andrea (Mike) Giangiordano; numerous great grandchildren and step grandchildren & two great great grandchildren. Joe was preceded in death by his parents. The family will receive friends from 11:00 AM to 1:00 PM on Saturday, August 11, 2018 at the Bryan and Hardwick Funeral Home where a celebration of life service will be held at 1:00 PM. Burial with military honors will conclude at the Irville Cemetery, Nashport, OH. Memorial contributions can be made to Genesis Hospice, The Boy Scouts of America or to a charity of your choice in Joe’s name. The Bryan & Hardwick Funeral Home, 2318 Maple Ave. Zanesville is in charge of the arrangements. To share memories and condolences with Joseph’s family please click on the Guest Book link on this page.